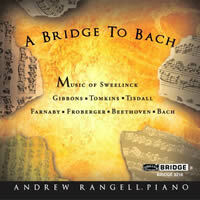 “A Bridge to Bach.” Works by Orlando GIBBONS, Jan Pieterszoon SWEELINCK, William TISDALL, Thomas TOMKINS, Johann FROBERGER, Ludwig van BEETHOVEN, Giles FARNABY, Johann Sebastian BACH. Andrew Rangell (pno). Bridge 9216 (http://www.bridgerecords.com/). For years Rangell has opened recitals with a 17th-century piece, so his interest is no whim. Sweelinck (four tracks) and Tomkins (three) get the most room; without denying his Steinway D’s color and dynamics, he produces contours the early-music listener will recognize. Pointing towards the tragic grandeur and triple counterpoint of Bach’s F-minor Sinfonia (BWV 795) is inspired, though I’m less sure about the pianofied fugue from Beethoven’s Op. 131 quartet. Revealing notes and intimate sound. 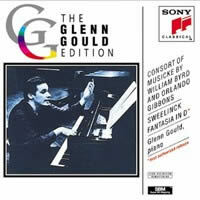 “Consort of Musicke by William Byrd and Orlando Gibbons.” Glenn Gould (pno). CBS / Sony Japan 75DC 473 (mid-1980s, O/P), Sony SMK 52589 (http://www.sonybmgmasterworks.com/). Out of Gould’s entire catalog, this 1971 album of virginal music was his favorite. (Mine too.) Comparing his rendition of Gibbons’ Lord of Salisbury Pavan and Galliard to Rangell’s is telling. The Gould is on target — a lingering pavan that sounds enervated in the middle section, then a dazzling galliard; Rangell allows them equal time. Gould’s penchant for closely miking the piano rejected convention. The remastered Sony (1993) normalizes him, so it’s both “better” and much worse. “Una Nuova Inventione per Maria Barbara.” Domenico SCARLATTI: Sonates (18). Aline Zylberajch (pianoforte after Cristofori). Ambronay AMY002 (http://www.ambronay.org/). Distributed in the US by Harmonia Mundi (http://www.harmoniamundi.com/). Scarlatti’s employer ordered five pianos from the Cristofori workshop in 1730. A Denzil Wraight copy (56 keys, no pedals) may be the calling card, but Zylberajch’s strong and secure fingerwork is the reason to stay. Her canny program moves from minor to major, and its qualities speak as clearly as via harpsichord — downhill racing on K. 49, forte chords in K. 490, speed on the straights of K. 517, the accented Minuet from K. 391. A halo-like stop enhances K. 481’s harmonic suspensions. 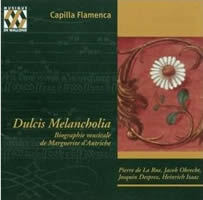 “Dulcis Melancholia: Biographie musicale de Marguerite d’Autriche.” Works by Pierre de LA RUE (4), Josquin DESPREZ (3), Luis MILAN (2), others 1 each. Capilla Flamenca, Dirk Snellings (dir.). Musique en Wallonie MEW 0525 (http://www.musiwall.ulg.ac.be/). Distributed in the US by Forte Distribution LLC (http://www.fortedistribution.com/). Margaret of Austria (1480-1530) was famously sorrowful yet accomplished much. This CD posits a life from her songbooks. A quintet (lute foremost) delivers the varied dances and accompaniments with snap, and the one-per-part singers grow as they proceed. Pierre de la Rue (c. 1452-1518) was the composer closest to her heart; his songs mirror his sacred practices — webs of imitative counterpoint and somber harmonies. Josquin’s In pace connects Psalm 10 and the funeral rite, to masterly effect. 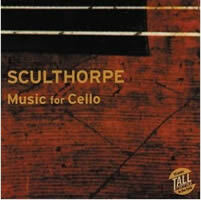 Peter SCULTHORPE: Music for Cello. David Pereira (vc), Ian Munro (pno). Tall Poppies TP136 (http://www.tallpoppies.net/). 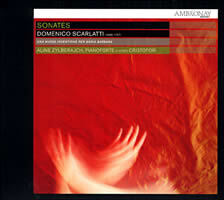 Distributed in the US by Albany Music Distributors (http://www.arkivmusic.com/classical/LabelList?dist=4).